According to the Bernoulli’s principle when area available for the fluid to flow decrease then flow velocity of the fluid increase and at the mean while time the fluid pressure or the fluid potential energy decreases (R.K. Bansal (n.d)). This principle was name after the Daniel Bernoulli who first writes this principle in book named Hydrodynamic. According to Miller, R.W (1996) Law of conservation of energy was the main deriving factor behind the derivation of the Bernoulli’s principle. Bernoulli’s principle state that the in a steady flowing fluid the sum of all the mechanical energies including kinetic energy, dynamic head, fluid pressure and potential energy should remain same at all the point of the flow. So if any type of energy increase like if kinetic energy increase then the other type of the energy like potential energy, pressure will decrease to make the final sum same as before. From Bernoulli’s principle it can be stated that the density and pressure are inversely proportional to each other’s means high density fluid will apply more pressure while moving than the low density fluids. In the horizontal pipe where the inlet and outlet of the are at same height, the z quantity can be removed to give the above mention equation of Bernoulli’s principle a new look from where we can calculate the height at any point of the flow if we have the initial height of flow and velocity at respective positions. 1. Place the venture meter on to a horizontal surface and note the height of input valve and output valve and make sure they are same. 3. Open all the air bleed valves of the manometer present at the top. 4. On the power supply to run the pump and adjust the flow rate control valve until water level in all the manometers is at readable range. 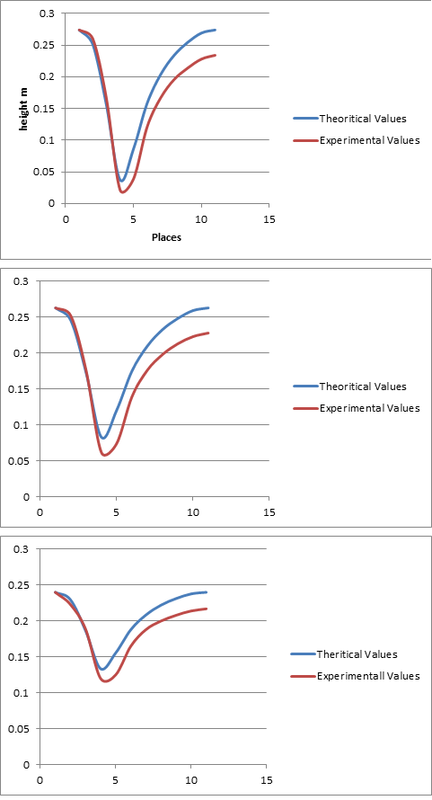 Aim objective of this experiment was to discuss the behavior of ideal and real fluid and on the basis of the test result it can be concluded that the experiment was successful because there is difference in measured and theoretical values. This is because of the friction losses in the real fluid; ideal fluid does not have friction losses. From the experiment it can be conclude that with decrease in area of flow there is an increase in velocity and decrease in the flow pressure of the fluid.